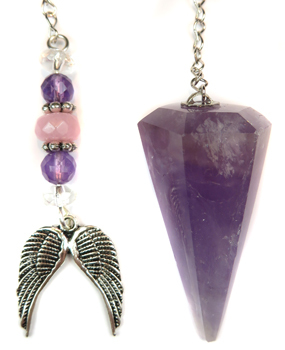 Faceted Amethyst pendulum featuring a pewter pair of angel wings charm, pewter daisy spacers, two faceted Quartz beads, two faceted Amethyst beads and a smooth round Rose Quartz bead. Comes with a velveteen pouch. Quartz: Known as the "master healer" and will amplify energy and thought, as well as the effect of other crystals. It absorbs, stores, releases and regulates energy. Draws off negative energy of all kinds, neutralizing background radiation, including electromagnetic smog or petrochemical emanations. Balances and revitalizes the physical, mental, emotional and spiritual planes. Cleanses and enhances the organs and subtle bodies and acts as a deep soul cleanser, connecting the physical dimension with the mind. Enhances psychic abilities. It aids concentration and unlocks memory. Stimulates the immune system and brings the body into balance. Harmonizes all the chakras and aligns the subtle bodies. Chakra(s): Crown. Rose Quartz: The stone of universal love. Restores trust and harmony in relationships, encouraging unconditional love. Purifies and opens the heart at all levels to promote love, self-love, friendship, deep inner healing and feelings of peace. Calming and reassuring, it helps to comfort in times of grief. Dispels negativity and protects against environmental pollution, replacing it with loving vibes. Encourages self-forgiveness and acceptance invoking self-trust and self-worth. Good energetic support for those with leukemia. Rose Quartz is said to have power to increase fertility and to protect both mother and unborn fetus from miscarriage. Chakra(s): Heart.